Dig Deep Races offer 4 different races out into the Peak, all starting from Whirlow Hall Farm on the western edge of Sheffield. I upgraded from the 30 mile ‘Intro Ultra’ to the 60 miler (different course) 3 weeks before the race, not knowing we’d get a heatwave! 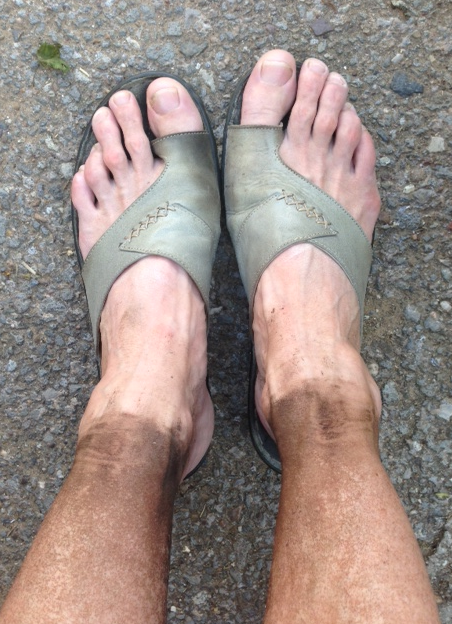 I quit at 31 miles but thought I’d write it up anyway as it’s a good challenge! I drove up a few days before the race with Dave’s family to suss out where the farm was, as the race briefing was at 7:30 on the Sat morning, with the Start at 8. I had a 14 hour schedule – to get back just as it’s going dark! They supply a 1:40000 map of the route which you can collect from Outside in Hathersage, and I’d also done 1:25000 sheets from Anquet. I registered and dropped off my 3 food parcels for 15 & 25 miles (Moscar – Parcel 1), Yorkshire Bridge (Parcel 2) and Bradwell Sports Club (Parcel 3 – unclaimed – they are welcome to my boiled egg, crisps and Red Bull). At the briefing they told us they had 700 litres of water out on the course as it was one of the hottest days of the year! We set off at 8am at quite a pace. The route was marked to Checkpoint 1 at Fiddler’s Elbow (11km) where there was water. 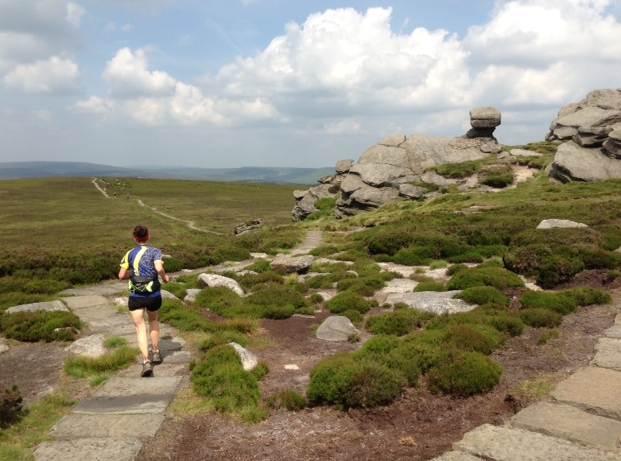 A short path section was marked after this but not to the road so I lost 5 mins and nearly went up Higger Tor! 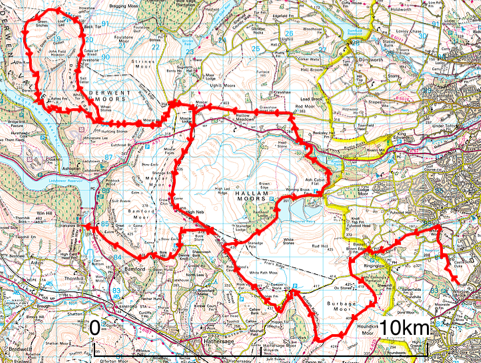 After that was a loop round Redmires and Rivelin Reservoirs and back west to Checkpoint 5 (and 8) at Moscar. I got there at 11:30, about 15 mins behind schedule and very sweaty! Dave met me there for the lasso bit around Lost Lad, which was 15km with quite a bit of climb – predicted and actual time 2h 30. This was a lovely loop with checkpoints on Lost Lad and Ladybower, then a big climb up back to Derwent Edge (see dip at 5hrs on altitude graph!). Got back to feed box at Moscar at 1:45 and considered quitting then as I felt quite sick in the heat but I sat in a marshall’s chair and took on some food and decided to carry on until Yorkshire Bridge and then decide. 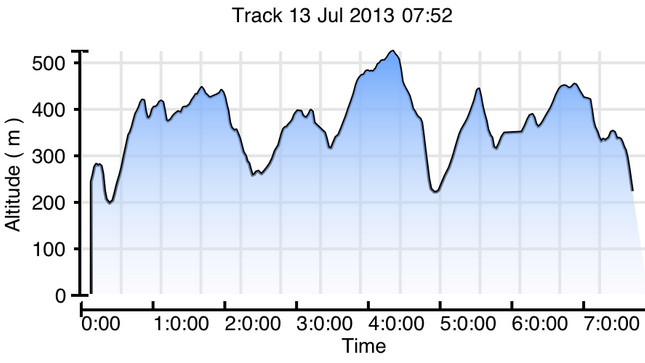 Anyone planning to do this race should schedule in proper rest time as well as running time – I was there for 15 mins. 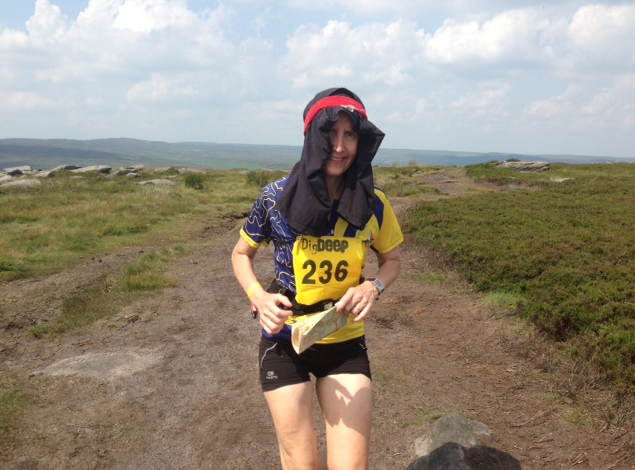 I set out with Dave over Stanage – another tip is to take a Buff to dunk in streams from time to time – I had to run with Dave’s T shirt under my headband!! Dave turned round to get the car and I continued to Yorkshire Bridge on the road below Bamford Moor. I was still running but the sight of Win Hill looming above me and the fact that I was 2hrs behind schedule (= midnight finish) made me decide to stop here. Grabbed a coffee from the flask and drove back to retrieve my car and report in as ‘Retired’ in Whirlow, where there was a welcome bowl of stew and a nice bench. Finishers in the 30 mile race were being clapped in in the next field but we were too gutted to go and watch. A marshall told me that the winning time for this was 1hr 30 slower than last year due to the heat.